Do you have a great idea for a business or company? Are you concerned that you should patent your idea before someone else comes up with a similar idea? While you cannot technically patent an "idea" for a business or company, you might be able to protect a specific method of doing business with a patent. Below is what you need to know about patent protection. Patents are obtained for specific "inventions" and they grant the "inventor" (or patent owner) the right to the invention. They can be granted for new, non-obvious, and useful inventions for up to 20 years from the date that the patent application was filed. During this time period, the patent provides you with the right to "exclude others from making, using, offering for sale, or selling" your invention in the United States. U.S. patents are issued by the United States Patent and Trademark Office. While a patent's term usually begins on the date the application was filed, there are special instances in which the date from an earlier (and related) application can be used, as long as the correct fees were paid. In addition, patents are territorial, which means that you will need to apply for patent protection in individual countries. U.S. patents, for instance, are only effective within the United States and U.S. territories. There are three types of patents that you can apply for based on your idea (and the nature of your invention), which include design patents, plant patents, and utility patents. A design patent applies to surface ornamentation that is applied to an article that is then manufactured. So, if you design something that alters or changes the look or appearance of an article that is then reproduced for sale, you are eligible to secure a design patent. The limitation is that this type of patent only lasts 14 years and is not renewable. 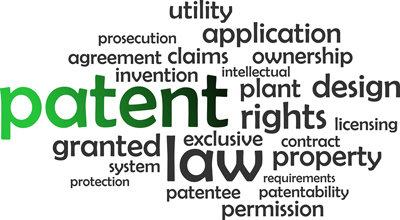 A plant patent is for the protection of a new variety of plant or plant in an "uncultivated state", meaning its origin is unique and not yet produced to sell. Hybrid plants, mutant plants, or previously unknown seedlings all are eligible for protection from a plant patent. It is advisable to seek legal counsel when applying for this type of patent, especially if more than one inventor is involved. Plant patents remain active for 20 years from the day the application was filed. If your business idea is a little more abstract, then you might be able to apply for a utility patent, as these patents can be granted to anyone who discovers or invents something new and useful, including a composition of matter, a machine, process, or a new and useful improvement on one of these items. While this is fairly broad, the U.S. Patent and Trademark Office (USPTO) is very specific about the requirements for utility patents, so you should make sure that you complete extensive research prior to applying. For instance, according to the USPTO, "Your idea must be new, non-obvious (meaning that anyone with the same skill set would not have been able to come up with the same idea), and you must be able to clearly explain and document your idea so someone with similar skills is able to easily replicate your invention." It is highly recommended that you consult a patent lawyer prior to applying for a patent. Your patent attorney will be able to ensure that you are meeting all of the filing requirements and that you are preparing all of the documents correctly. If you are indeed able to patent your invention, it is worth securing a patent so you can ensure that your idea will be protected in the future. Copyright: If your business or company focuses on creating any original written music, works, or videos, then those can be covered by copyright laws. You can claim copyright protection through the U.S. Copyright Office. However, remember that copyrights do not protect any concepts, ideas, methods, or systems for completing something. Trademarks: A trademark will protect colors, names, sounds, symbols, or words that differentiate specific services and products. Unlike patents, trademarks can be renewed forever, as long as they continue to be used. Getting a patent for your idea is an excellent way to protect your invention before someone else "invents" the same thing!